Mood board: Sportmax is quickly becoming the go-to label for every minimally inclined, sport-chic woman who finds Céline a tad too challenging. The clothes are cut with razor-sharp lines and details and yet still manage to look completely laid back, which is no easy feat. Best in show: There were plenty of pieces to pluck straight from the runway and stick into your closet - such as the boxy jackets with oval-shaped contrast pockets or the flared cropped trousers. But we loved the touches of cool pattern and print that edged their way onto super simple silhouettes, like a brilliant white chain-link motif that was woven into a crisp navy blue knit two-piece with a peplum top. 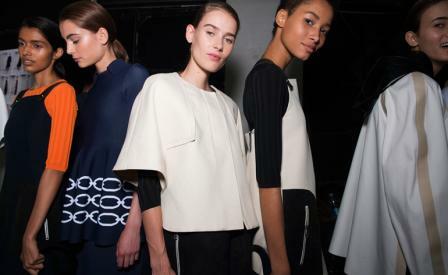 Scene setting: Sportmax moved from its usual white box into Luigi Boggi’s mid-century, former post office. The interiors were transformed into maze-like configurations thanks to the endless reams of clear PVC sheets conceived by Amsterdam-based Italian designers Andrea Trimarchi and Simone Farresin of Formafantasma.